Former Australia Post employee Joao Oliveira says he was unfairly sacked after raising concerns about dangerous driving putting motorists at risk. Australia Post has sacked an employee for damaging its "public reputation" after he filmed truck drivers putting motorists' lives at risk by illegally running through a stop sign. Joao Oliveira says he "tried to do the right thing" by blowing the whistle on the reckless behaviour earlier this year, after he and another motorist were "nearly taken out" by trucks exiting the Boud Avenue Mail Centre at Perth Airport. Mr Oliveira anonymously provided the footage to news.com.au after his internal complaints were ignored - but Australia Post quickly figured out who he was and sacked him last week following a disciplinary inquiry. "I'm going to put in an unfair dismissal claim," Mr Oliveira said. "I tried to warn them, but they didn't want to do anything about it. I thought I'd warn the public - it's reckless driving, a criminal offence. I thought I was bound by law." Mr Oliveira says he was "called a liar all the way" when he raised the issue. "They seemed to think it didn't happen," he said. "The official reason (for the dismissal) was basically for going to the media and bringing Australia Post into disrepute." An Australia Post spokeswoman said Mr Oliveira was terminated from his $70,000-a-year role for "breaches of his contract relating to safety". "Mr Oliveira has been dismissed for repeatedly failing to meet his obligations as an Australia Post employee with multiple breaches of his contract of employment over a period of time," she said. "These include serious safety breaches involving a forklift. The safety breaches included an incident of causing damage to a truck and then using the forklift to attempt to fix the damage, and a second incident where a forklift was driven into rubbish bins." 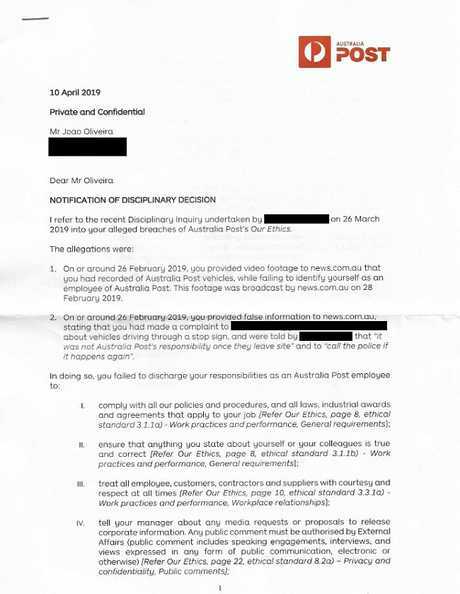 Joao Oliveira’s termination letter from Australia Post. He was accused of damaging its ‘public reputation’. Australia Post claimed he was sacked for safety breaches. 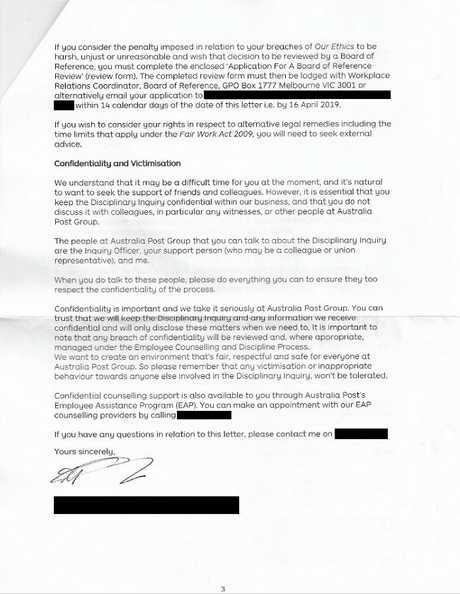 Documents provided to news.com.au show Mr Oliveira was subject to an earlier disciplinary decision over a safety incident, but the outcome was he was transferred to a different role and ordered to undergo medical checks. His April 10 termination letter makes no mention of safety breaches. It instead says he breached Australia Post's "Our Ethics" guidelines when he "provided video footage" and "false information" to news.com.au. "Your unacceptable behaviour includes but is not limited to … intentionally or recklessly engaging in conduct that damages our interests, employee relations or public reputation," the letter said. 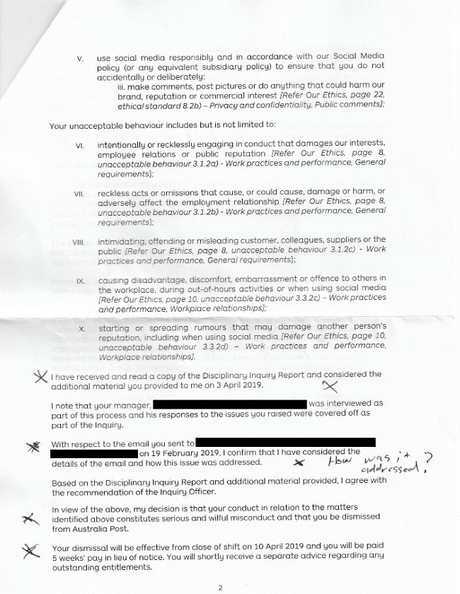 His unacceptable behaviour also included "intimidating, offending or misleading customers, colleagues, suppliers or the public" and "starting or spreading rumours that may damage another person's reputation, including when using social media". 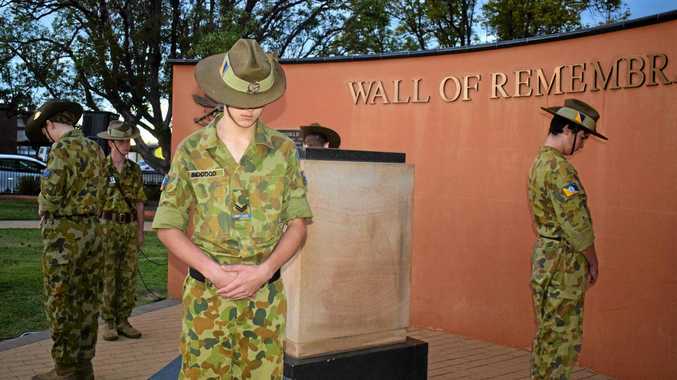 "My decision is that your conduct in relation to the matters identified above constitutes serious and wilful misconduct and that you be dismissed from Australia Post," the letter said. 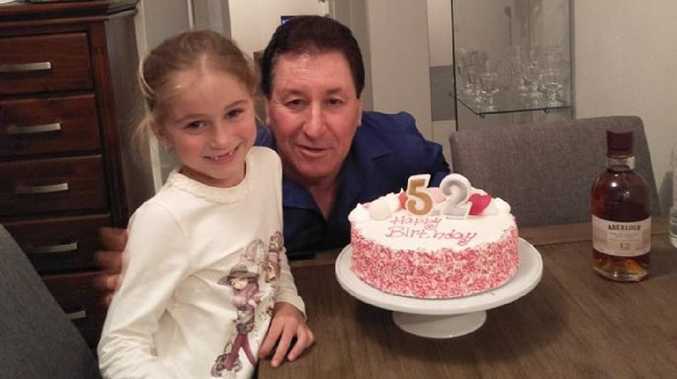 Mr Oliveira, who worked at Australia Post for nearly eight years, says he's "not feeling the best, to be honest" and needs to find another job soon to pay his bills. In the meantime, he will take his case to the Fair Work Commission. "These guys are bastards," he said. "You obey the law by reporting a crime and they punish you."